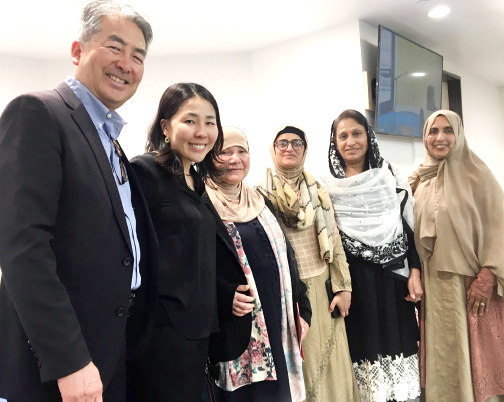 Assemblymember Al Muratsuchi (D-Torrance) and his wife, Hiroko Higuchi, showed their support for the local Muslim American community at an interfaith solidarity service on Sunday at the Islamic Center of the South Bay. Christians, Jews, and Muslims came together to pray for the Muslim victims of the New Zealand mass shooting by a white supremacist. “This horrific, planned attack has left us heartbroken as we mourn the victims who left us too soon. There is no doubt that anti-Muslim hate motivated the suspected killer. “With the rapid uptick in targeted violence, we are in danger of accepting terror attacks as the rule when it shouldn’t even be the exception. We must take action as a nation to defend our people, values, and the freedom to practice any faith. “We are in solidarity with our Muslim siblings and New Zealanders in the wake of this tragedy. The other members of the caucus are Assemblymember Al Muratsuchi (D-Torrance), vice chair; Sen. Richard Pan (D-Sacramento), vice chair; Assemblymember Ash Kalra (D-San Jose), parliamentarian; Assemblymembers Rob Bonta (D-Oakland), Ed Chau (D-Monterey Park), Kansen Chu (D-San Jose), Todd Gloria (D-San Diego), Evan Low (D-Campbell), Adrin Nazarian (D-Van Nuys) and Phil Ting (D-San Francisco). “The attacks in New Zealand confirm that white nationalism is a threat that the world can no longer ignore. Hatred of immigrants and Islamophobia are global phenomena, yet every attack continues to be personal for all of the communities that we serve. “People of Arab, Middle Eastern, Muslim and South Asian descent are no strangers to the violent scapegoating of minority communities, including physical attacks and killings post-9/11 and in an era of rising white nationalism. The Trump Administration shamefully perpetuates a narrative of fear through policies like the Muslim ban and in the surveillance of mosques and Muslim communities. This fear-mongering has direct consequences for the lives of our people as we saw today in Christchurch.